I know probably what you are thinking , we do we need to specify semicolon in my code explicitly? I am getting the right output always without specifying a semicolon also. Well it’s not always right. But it’s not right , the output is undefined . 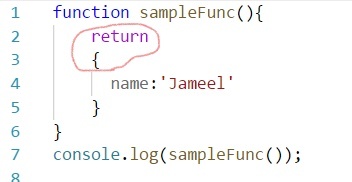 When you put object literal in the next line of return statement , syntax parser will do a automatic semicolon insertion after the keyword return and jump out of the function.